The U.S. Space-Based Positioning, Navigation, and Timing (PNT) Executive Committee (ExCom) has issued a new set of tasks that it wants its advisory board to take up over the next 14 months with topics including civil and commercial GPS receivers that don’t comply with technical specifications, a national PNT architecture plan, and the effects of PNT outages particularly on the nations cyber networks. Presented at an October 14 board meeting by Anthony Russo, director of the National Coordination Office (NCO) for PNT, the ExCom’s tasking include a request that the board submit a written report of findings and recommendations by February 2012. 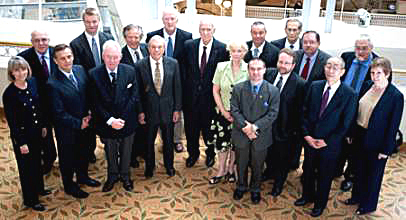 The advisory board is a federal advisory committee established by NASA on behalf of the ExCom, an interagency coordination body established under a 2004 national security policy directive.The 18-member board is chaired by former defense secretary James R. Schlesinger and co-chaired by Brad Parkinson, the first director for the GPS Joint Program Office. Most of the five topics identified by the ExCom have been the subject of discussion over the past year not only by the committee and its advisors but also in many cases by the wider GPS community. For instance, the issue of non-compliance arose recently when a manufacturer of GPS equipment was discovered to have used reserved bits in a navigation message frame as part of the receivers’ operation. When the Air Force implemented a new signal protocol as an upgrade to the GPS Operational Control Segment, those receivers began malfunctioning. Other problems have arisen due to incorrect assumption on almanac time and incorrect implementation/interpretation of an interface specification, according to the GPS Wing, which is responsible for establishing GPS technical standards in the form of published interface control documents (ICDs) and interface specifications. These are intended to give receiver manufacturers design guidance and ensure backward compatibility during modernization efforts. Until now, manufacturers have been expected to comply with these specifications for all types of receivers, although no formal, industrywide process exists to ensure that it occurs, particularly for civil and commercial GPS equipment. The tasking asks the advisory board to investigate whether this somewhat passive approach is enough or whether a receiver certification process — implemented by either government or private sector — is needed. In a presentation to an ION GNSS 2010 panel discussion last month, Col. Bernard Gruber, the GPS Wing’s new commander, said his organization is “exploring new certification paradigms” to ensure technical compliance. The advisory board’s second task is to perform an independent assessment of the way ahead for the National PNT Architecture Implementation Plan and suggest means that federal departments and agencies can ensure its successful implementation. This mission dates back to January 2006, when the ExCom tasked the NCO and the Department of Defense’s National Security Space Office (NSSO) to develop an overall portrait of the U.S. PNT architecture and a 20-year strategic outlook to guide near- and mid-term decisions on PNT capabilities. The project, which was carried out by NSSO and the Department of Transportation’s Volpe Center assumes GPS as a “cornerstone” technology and seeks to bring order out of the diverse array of existing PNT technologies while identifying unmet civil and military PNT requirements that may require expanded GPS capabilities or development of other PNT resources. The tasking for a GPS commercial outage impact assessment and the related evaluation of the role of PNT in cyber networks reflects continuing anxiety about the prospect of over-reliance and vulnerable dependence on GNSS in the nation’s critical infrastructures. Finally — and presumably to support this more ambitious workplan for its advisors — the ExCom asked that the board establish a subcommittee "capable of evaluation and timely feedback on emerging technical issues." The subcommittee would be chaired by one or more members of the advisory board and could include other representatives from industry or academia selected by its chairs. The subcommittee would convene only in response to specific taskings.